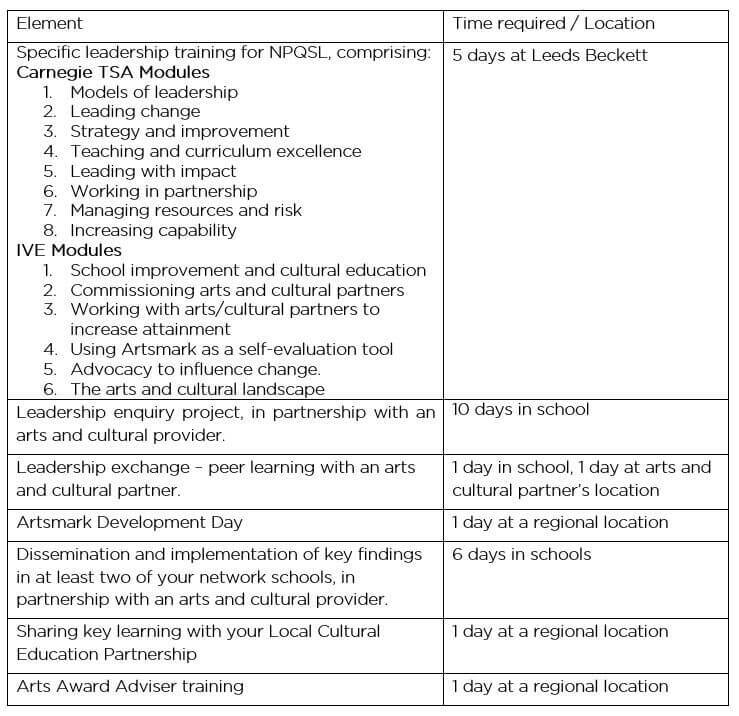 Cultural Leaders in Education (CLE) is a leadership development programme for middle and senior leaders in schools interested in developing their role in influencing a whole school approach to arts and cultural provision. The programme is led in partnership with and accredited by Carnegie Teaching Schools Alliance (TSA). Participation in the programme will lead to attaining the National Professional Qualification for Senior Leadership (NPQSL). CLE will enable up to 12 selected leaders from primary, secondary, PRU and special schools across Yorkshire and the Humber to address school improvement priorities and transform the learning experience for their students through strategic planning, innovative pedagogy and practice in cultural education. This is a 26 day programme. Participants will benefit from the guidance and support of Carnegie TSA and 2 support sessions from IVE. NB Further time will be required by you to complete your NPQSL assignment. Participants will additionally be able to access four free places on IVE’s schools CPD twilights for any staff at their school. The eight art form-specific sessions will cover: drama; dance; visual art; film; digital; music; creative writing and museums. IVE will contribute £5000 for each participant. This must be 100% cash matched by your school with £5000 from your Pupil Premium funding. Applications must evidence the full support of your Headteacher (NPQSL) and of your cluster leader (IVE) for attendance at all programme strands and include a commitment to £5000 match funding from Pupil Premium.